Q. What is a Laparoscopic Pyeloplasty ? A Laparoscopic Pyeloplasty is a minimally invasive surgical procedure to correct a blockage or narrowing (puj obstruction) of the junction of the kidney to the tube draining urine. Q. Why is Laparoscopic Pyeloplasty performed ? Obstruction of the ureteropelvic junction (UPJ) can be caused by congenital abnormalities like horseshoe kidney, fibrous scarring due to stone or previous operation, a blood vessel which may cause it to kink or a stone that gets impacted in the upper part of ureter. This can cause damage to kidney tissue and eventually lead to pain, stones, infection, high blood pressure, deterioration of kidney function and kidney failure. Laparoscopic Pyeloplasty is the procedure of choice to relieve all these symptoms. Q. Who is an ideal candidate for Laparoscopic Pyeloplasty ? If you have obstruction of the ureteropelvic junction (UPJ) which can be caused by congenital abnormalities like horseshoe kidney, fibrous scarring due to stone or previous operation, or if you have a blood vessel which may cause your ureteropelvic junction (UPJ) to kink or if you have a stone that gets impacted in the upper part of ureter, then you are an ideal candidate for Laparoscopic Pyeloplasty. Remember not to eat or drink anything after midnight the evening before your surgery. Clear liquids are liquids that you are able to see through. Q. How is the operation done ? 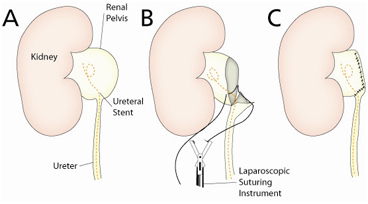 Figure : an illustration of the kidney and ureter before, during and following the procedure. The operation can take 3-4 hours, but can vary depending upon the individual. Three small cuts (approximately 1cm) are made in your stomach to perform the operation. A small plastic tube (stent) is placed inside the pipe leading from the kidney (ureter) at the beginning of the operation to bridge the surgical repair and help urine to drain freely from the kidney involved. 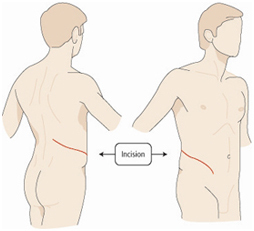 Figure: Traditional open kidney surgery is performed through an 8-12 inch incision extending from the ribs towards the abdomen. A portion of one of the ribs is usually removed as part of the surgery. Q. What is the recovery period like following Laparoscopic Pyeloplasty ? You will spend the next few hours following Laparoscopic Pyeloplasty, in the recovery room to monitor your vital signs and observe for any immediate post-operative complications. You will be hospitalized for 24 - 48 hours following Laparoscopic Pyeloplasty. Pain medication and antibiotics will be given post-operatively. The stent will be removed 4 - 6 weeks after Laparoscopic Pyeloplasty. Avoid performing strenuous activities like lifting something heavy, jogging, treadmill or playing sports for at least 2 weeks after Laparoscopic Pyeloplasty. You will be instructed to move around, avoid getting constipated, do some very simple breathing exercises to help prevent respiratory infections. You will be able to perform all your routine daily activities in about 2 - 4 weeks time after Laparoscopic Pyeloplasty. Although this procedure has proven to be very safe, as in any surgical procedure there are risks and potential complications. The safety and complication rates are similar when compared to the open surgery. Bleeding : - Blood loss during this procedure is typically minor (less than 100 cc) and a blood transfusion is rarely required. If you are still interested in autologous blood transfusion (donating your own blood) prior to your surgery, you must make your surgeon aware. When the packet of information is mailed or given to you regarding your surgery, you will receive an authorization form for you to take to the Red Cross in your area. Infection : - All patients are treated with broad-spectrum intravenous antibiotics prior to starting the surgery to decrease the chance of infection from occurring after surgery. If you develop any signs or symptoms of infection after the surgery (fever, drainage from your incision, urinary frequency, discomfort, pain or anything that you may be concerned about) please contact us at once. 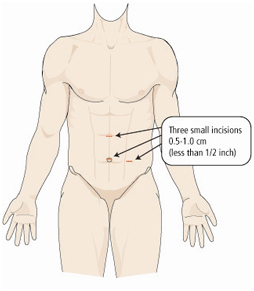 Hernia : - Hernias at incision sites rarely occur since all keyhole incisions are closed carefully at the completion of your surgery. Tissue / organ injury : - Although uncommon, possible injury to surrounding tissue and organs including bowel, vascular structures, spleen, liver, pancreas and gallbladder could require further surgery. Injury could occur to nerves or muscles related to positioning. Conversion to open surgery : - this surgical procedure may require conversion to the standard open operation if extreme difficulty is encountered during the laparoscopic procedure. This could result in a larger standard open incision and possibly a longer recuperation period. Failure to correct UPJ obstruction : - Roughly 3 % of patients undergoing this operation will have persistent blockage due to recurrent scarring. If this occurs additional surgery may be necessary. Q. What is the outcome of Laparoscopic Pyeloplasty ? Laparoscopic Pyeloplasty almost has a success rate of 95%, there is reduced hospital stay (one day in younger, healthy patients), faster healing and quicker return to normal activity and work.